Charles Frederick Worth, Elsa Schiaparelli, Cristobal Balenciaga, Paco Rabanne, and Raf Simons — these are just some of the illustrious designers who have ensured Paris’ status as one of the fashion capitals of the world for more than a century. And while they each had their own very unique styles, they have one thing in common: they were all immigrants, drawn to the French capital by the prospect of artistic freedom. 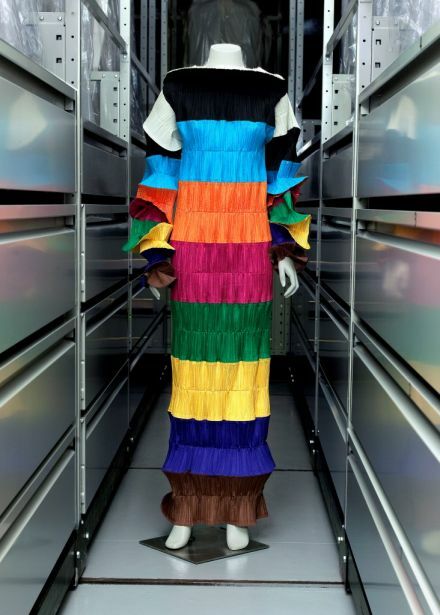 Starting December 9, the Museum of Immigration History in Paris is putting on “Fashion Mix: French Fashion, Foreign Designers,” a major exhibition in partnership with the Palais Galliera, Musée de la Mode de la Ville de Paris, which highlights the significant contributions made by foreign designers to French fashion over the last century and underlines the diversity that typifies the French fashion school. Curated by Olivier Saillard, director of the Palais Galliera, the exhibition will be divided into two parts, the first reflecting on French fashion and the influences of a handful of foreign couturiers who set up houses in Paris, such as Worth (British), Mariano Fortuny (Spanish), and Schiaparelli (Italian), right up to the influx of contemporary designers from around the world who present their collections on Parisian catwalks. Saillard’s curation highlights how formal and aesthetic connections emerged over the last century, showcasing style families that “link” designers through the period. Opening with Worth, the founding father of couture, and his designs, Saillard’s curation will introduce the concept of a “British school” from the 19th century to the present day, as well as that of an “Italian school,” centered in the the 1930s with Schiaparelli whose designs will be juxtaposed against contemporary followers such as Romeo Gigli, Popy Moreni, and Riccardo Tisci. Another focus of the exhibition is the “Spanish school,” led by Cristobal Balenciaga, which provided a strong influence on French fashion from the 1930s to the 1950s, extended by Paco Rabanne, the enfant terrible of the 1960s. Very contemporary pieces by Sybilla are displayed alongside Balenciaga designs to underline the enduring legacy of the Spanish master. “We want to showcase the sense of community you can find amongst people of similar nationalities. They sometimes have similar aesthetic approaches: black for Japanese tartan for English,” Saillard explains. “That said, you can’t reduce a designer to his birthplace or own geography; that’s the beauty of Paris, which has proven a foil for creative expression. Whereas in London, Milan, or New York there is always a commercial dimension to consider, this is lessened, I think, in Paris where there is a greater focus on creativity. As a result, Paris offers foreign designers an opportunity to experiment, away from their native context,” he adds. Beyond the dresses, the exhibition will also contextualize the immigration story of those designers with documents that tell very personal stories. “Like all the administration processes and papers Elsa Schiaparelli got in order in 1931 to become French, or Worth getting married to a French girl,” explains Saillard. The second part of the exhibition reflects more on the “increasing pace of interaction” in today’s society that has seen the appearance on the Parisian fashion scene of designers from all over the world, from the Austrian Helmut Lang to the Lebanese Rabih Kayrouz, and the Colombian Haider Ackermann, rather than featuring them geographically. An exhibition signifying and celebrating Parisian allure that draws in the fashion greats from all corners of the globe.